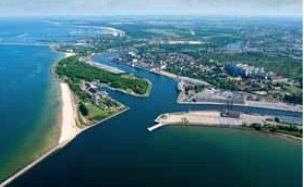 Gdansk Bulk Terminal has extended the berthing line at Bytomskie Quay 290 metres and deepened alongside draught to 7.9 metres, thereby allowing it to handle 15,000dwt vessels, in addition to those 25,000dwt vessels not conveying full loads. As a result, the facility has been able to handle a 19,000dwt vessel, transporting a load of 13,500 tonnes of barley. The terminal is equipped with a fully automated flat warehouse and a further 10 silos, giving it a capacity of 55,000 tonnes. It has the ability to offer grain drying in cleaning, too. Last year, Gdansk handled 1.6 million tonnes of grain, which was the best result in its history.